Choose your monthly contribution and then click Subscribe. Or donate through PayPal Giving Fund and PayPal covers the transaction fee. I am writing to share my excitement that we at ArtRage recently celebrated our tenth anniversary, and to promise you that we are not resting on our laurels but will continue to challenge, enlighten, provoke, excite, and uplift you for many years to come. 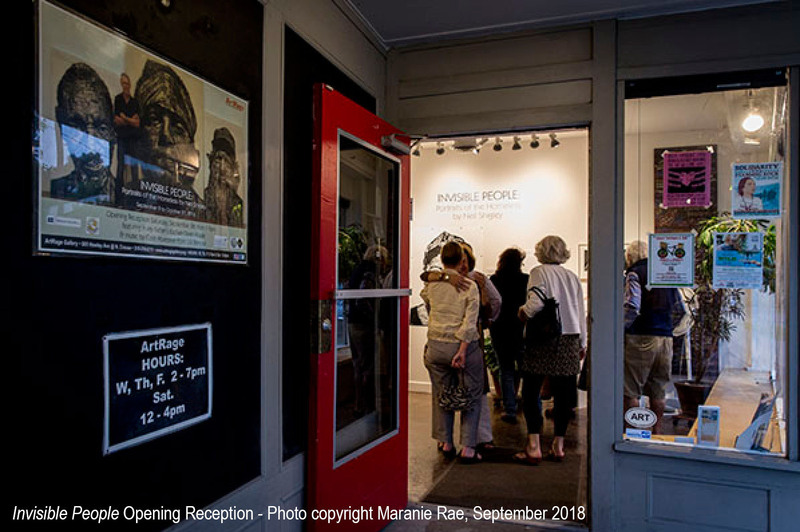 In the last ten years, ArtRage has held 55 exhibitions which featured 370 individual artists and 8 artist collectives. We hosted over sixty thousand visitors and partnered with community organizations 230 times for exhibitions and programs. Wow! Good on us! But the past ten years, and the next ten years, and the following ten years are only possible because of people like you, people who recognize our unique mission of presenting art that makes a difference, and who are willing to give us your generous support. I hope you saw our first show this year, presented in partnership with the homeless outreach organization In My Father’s Kitchen, in which San Diego based artist Neil Shigley explored the subject of homelessness by giving visibility to homeless individuals through his dramatic large-scale portraits. This was just one of many ways in which ArtRage collaborates with other community-based organizations around issues important to us all. You still have time to see our current show by Syracuse multi-disciplinary artist Ellen Blalock, who is known for her photography, video, and fiber art. “Stitching Stories” is part of the African American quilting tradition of story quilts, and it connects with the rich history of fiber arts found throughout the African Diaspora. It is dynamic and powerful work. And that is just the beginning. The final three exhibits this year include a photography exhibit about the First Nation Algonquin, a show of socially relevant Indian Folk art, and “ABOUT-FACE: 50 years after Stonewall” in collaboration with CNY Pride and SAGE Upstate, Inc. In addition to our exhibitions, we at ArtRage consistantly provide thought provoking programming. For example, we have hosted the Gifford Foundation “What If…” film series and moderated discussions since 2012. The free screenings focus on community change efforts across the country that can inform local efforts in Central New York. As you can see, we remain committed to work that enlightens and inspires, and to working with other organizations to further initiatives promoting change and social justice in our community. And so I am asking you to please join us in supporting this essential community resource by making an end-of-year donation to our work. In addition, there are still opportunities to become an exhibition sponsor this year or a season sponsor for next year. Thank you for your support. I hope to see you at the gallery!